​Serving God, and helping those who need help, are important. Christ Lutheran Church regularly sends volunteers to PADS homeless shelters to serve homemade hot meals, participates in CROP Walks to help fight hunger, and contributes volunteers, funds and materials to many other social services. Click on the links below to find out more. The Quilting Ministry has a purpose. It's to give comfort to God's children here, and around the world, by creating handmade quilts and donating them to Lutheran World Relief. You don't need to know how to sew to create beautiful quilts. 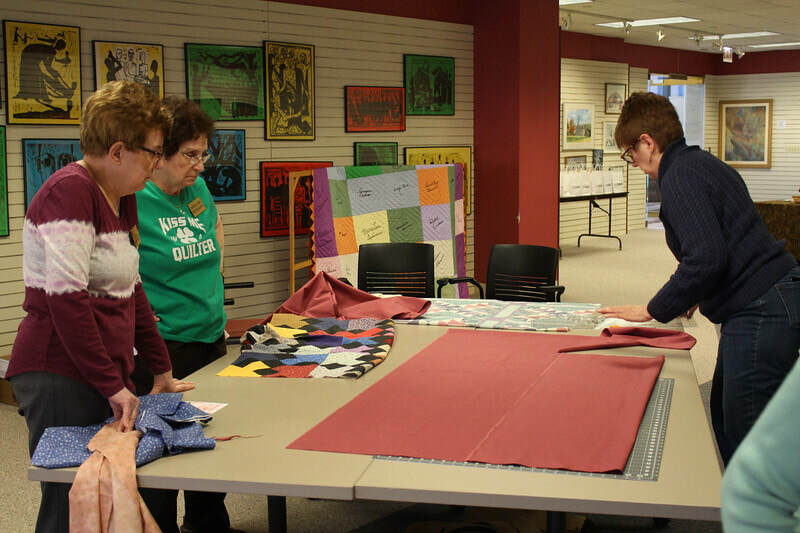 Come and learn how to quilt with this talented group, on the 2nd and 4th Fridays at 10:00 to 1:00, and don't forget to bring a sack lunch! Dolores is tying the quilt top and making the finishing touches to this handmade quilt. Carol and Carolyn are cutting elastic and opening corners on fitted sheets. 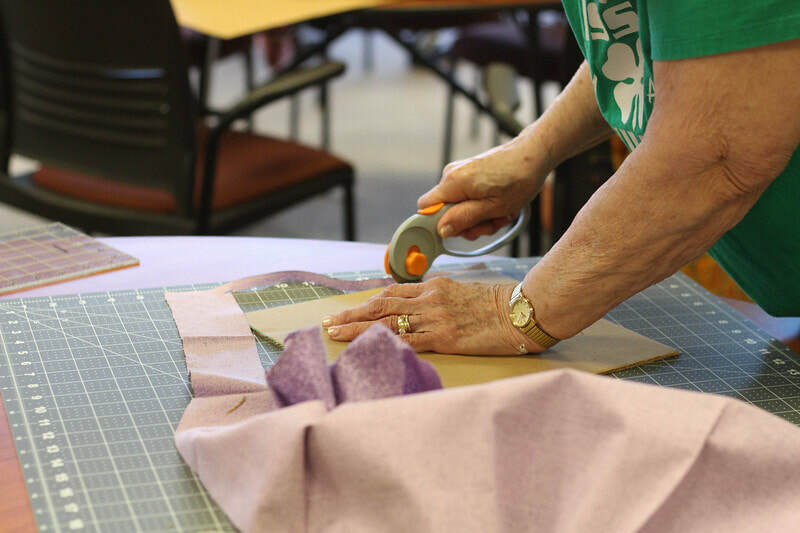 Even if you've never quilted before, you can create beautiful quilts with the quilting team. Here, Diane is using the rotary cutter to cut squares while Dolores is selecting the needed supplies to work on the quilt. February is the most brutal month for food pantries. By the beginning of February, the shelves at the pantry are almost bare. The food and household supplies donated during the holiday season are long gone, and food pantries are in desperate need of replenishing. To fill the need, on Superbowl Weekend, Christ Lutheran Church sponsors the Souperbowl of Sharing, a food drive held at a local grocery store. The Souperbowl of Caring has been an annual event that brings in over a ton of donated items. Volunteers ask shoppers to buy a can of food, a box of diapers, or paper products to donate to Hinsdale Community Services. How else can you get involved? You can donate food and supplies, help “shuttle” boxes of donations to the church, or help the following weekend to deliver all of the donations. Whatever your involvement, one thing’s for sure. You’re helping out families who need your help! Knitters meet at 10am the first and third Fridays of each month in the living room of Christ Lutheran Church. Small groups like the knitting group is an easy way to make new friends and feel more comfortable and a part of a bigger family of friends. If you're new to the area and are shopping around for a church, try joining a small group like this. • Christ Lutheran Church donates the proceeds from many of its fundraisers to support Hinsdale Community Services. The annual food drive held the first weekend in February, gathers over a ton of donated food, paper products and baby supplies for the food pantry at HCS Family Services. Ever feel like an angel is watching out for you? You might have, if you've been visited by a Minister of Care. People who are in crisis need help, and the Ministers of Care give the help that is needed in many forms. It may be a wholesome dinner, help with in-home physical therapy, a tin of cookies dropped off on a doorstep, shopping for groceries, a friendly visit over a cup of coffee, or driving a patient to the doctor. Whatever is needed is what you can expect when you're visited by a Minister of Care. If you like to directly improve the lives of people in crisis, consider becoming a part of this ministry. It's as easy as calling our church office at (630) 325-2220. Of, if you're in need of a visit by a minister of care, give us a call. Get involved. Make a difference. Share God's love. Today’s the day. Everywhere you look, there is good work waiting to be done. The ELCA and its partners offer a wide range of opportunities to get involved, get your hands dirty and get to work. From spending a year on the other side of the globe as a mission worker, to working as a youth leader at a local congregation, to providing comfort and shelter to victims of a natural disaster -- there are countless big and small ways that you can help share God’s love with the world. In doing so, you may be surprised how God blesses your life, too. Natural disasters like tornados and the flooding they bring on can devastate a family's finances. Health issues and loss of employment can also strain familys' resources. You can help families get back on track with their lives by donating to the ELCA Disaster Recovery. Christ Lutheran Church supports Lutheran World Relief and Lutheran Disaster Relief as they work with partners in 35 countries to help people grow food, improve health, strengthen communities, end conflict, build livelihoods, and recover from disaster.